We all have a few things in our closets that, truth be told, we don’t really know how to wear, right? For me, it’s scarves. Well, more specifically, silk ones. 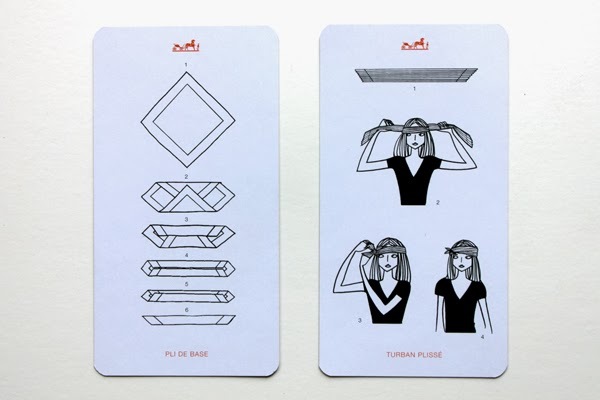 To help with my scarf situation, my perpetually chic mother-in-law gave me a deck of cards by Hermès that shows you dozens of ways to tie one on (dress! turban! sling for your broken arm!). But even with these handy illustrated cards, I’ve still been scarf shy. 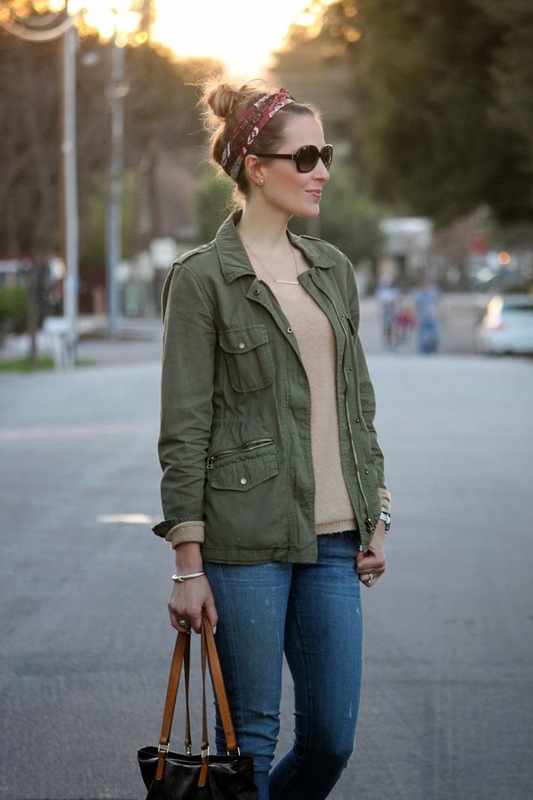 I’m pretty sure I don’t have the je ne sais quoi required to pull off most of these cool French-girl looks. 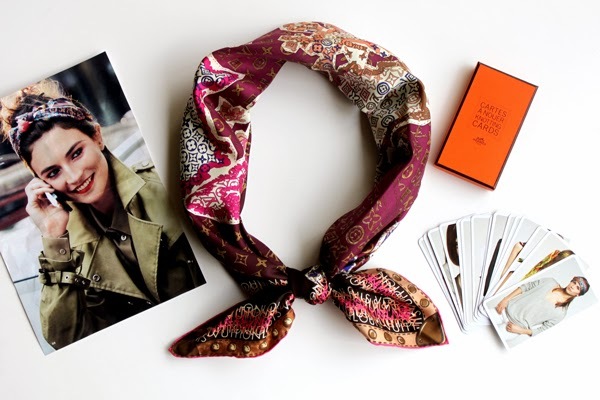 But I became hopeful when I opened a recent issue of Allure and saw a silky Louis Vuitton scarf paired with two things I most definitely have: a fatigue jacket and messy hair. Here’s the inspiration picture, a similar scarf of my own, and my knotting-101 cards. I tried to recreate the look shown above for a casual Sunday dinner date with Nick. First, I folded the scarf into the pli de base, shown below on the left, and tied my hair into a messy bun. Then I followed the instructions shown below on the right, except I wrapped the scarf around the nape of my neck before tying it at the top and tucked in the ends. I was afraid Nick would think it looked silly, but he thought it was really cute (although this could’ve just been the novelty effect, like that time I got bangs—admittedly not my best look—and he couldn’t stop smiling and calling me “new wife!”). Regardless, it’d been raining almost all weekend (cue the frizz), so this scarf-turned-headband also helped hide a bad-hair day. Now that I’ve learned to tie at least one knot, I think I’ll keep experimenting. According to my cards, this same silk square could also be a halter top, so stay tuned! Louis Vuitton scarf and bag. Lily Aldridge for Velvet fatigue jacket at Shopbop and Bloomingdales. Gap sweater (similar elbow-patch style on sale at J. Crew). Citizens of Humanity jeans (same cut, different wash). Latigo booties (sold-out online but found mine in-store, plus a similar option). Valentino sunglasses. BaubleBar bar pendant. David Yurman bracelet. Michele watch. I have those cards and tons of scarves, too! I have actually work a scarf at a halter top, I've also made one into a little purse when traveling, you can easily wear a really big one as a swim suit cover up tied around your hips or even criss crossed around your neck! Love this post! I love this look on you! Perfect for a rainy day. 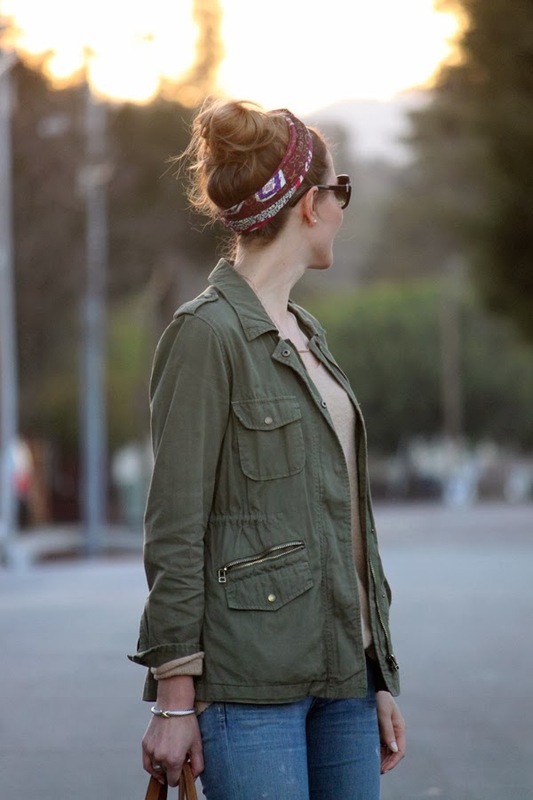 You've totally inspired my next "2nd day hair" look... totally perking it up with a fresh and sophisticated knotted scarf!